Seabrook Partners is an independent investment bank that provides strategic and financial advice to growing middle-market companies. The firm advises on M&A, raising growth capital, corporate valuations and financial restructuring transactions for privately-held companies. Seabrook is headquartered in Washington, D.C. and is a FINRA registered broker-dealer. The Seabrook team was extremely professional as they guided us through the process. They worked with us well in advance of the acquisition process to help prepare us for the due diligence conducted by prospective acquirer. Seabrook’s industry knowledge and M&A expertise were instrumental in CPC achieving its goal of selling the Company to a strategic acquirer. ADMMicro is a pioneer in the energy management solutions market. Our board of directors originally engaged the principals at Seabrook Partners to advise us on our strategic options and what initiatives we should undertake to maximize ADMMicro’s valuation. Over a period of two years, we met periodically to evaluate the progress. The Seabrook professionals eventually guided us through a merger with GridPoint, a private-equity backed smart grid company. We are delighted to have partnered with Seabrook Partners on the investment by Mainsail Partners. Seabrook guided us step by step through the process and demonstrated the knowledge, experience and commitment we look for in a strategic advisor. Founder and Co-CEO, Applications Technology, Inc.
We partnered with the professions at Seabrook Partners because of their knowledge, access and commitment. As technology entrepreneurs, it became immediately clear to us that they understood our business and could be effective from day one. Also, we did not want to sell our business immediately, but sought a partner that could guide us through our options over a period of time. The professionals at Seabrook Partners provided us that partnership and were at our side through the sale to eBay. Seabrook Partners was invaluable in helping the shareholders of Hughes Associates navigate the pros and cons of selling to a strategic or financial buyer. Seabrook ran a very professional process that allowed us to evaluate both options. We eventually decided to partner with Huron Capital, which enabled us to both realize liquidity for our shareholders and build a strong balance sheet for future growth. We are extremely happy with the outcome. Nexus Systems is a leading provider of integrated procure-to-pay (P2P) software for medium and large enterprises. Nexus Systems’ flagship product, NexusPayables, is a comprehensive SaaS software solution that automates and manages the entire accounts payable (AP) process from purchase to payment. The solution provides the operational efficiency, visibility and control required to improve cash management, and lower processing cost for companies handling high invoice volumes. The company is headquartered in Falls Church, Virginia and employs about 100 professionals. Mainsail Partners is a private equity firm specializing in middle market, late venture, management buyouts, recapitalizations, growth equity, and growth capital investments. The firm is headquartered in San Francisco, CA and focused on funding growth for “bootstrapped” technology companies. Nexus Systems was founded in 2000 by Tom Coolidge and Jennifer Coolidge. Like many entrepreneurs, they recognized a market opportunity and bootstrapped the growth for over a decade. In 2015, the management began to explore opportunities to accelerate its growth. Seabrook Partners positioned Nexus Systems around the sophistication of its technology platform, its SaaS-based revenue model and leadership position in the large and growing P2P market. Seabrook Partners marketed Nexus Systems to middle market growth equity firms that have demonstrated continued success in the enterprise/SaaS software sector. The process was highly competitive with numerous firms submitting term sheets. 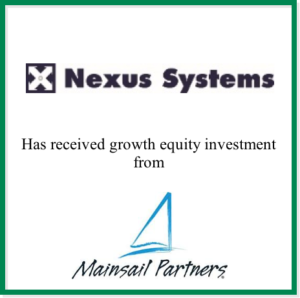 Nexus Systems secured $28 million in growth equity from Mainsail Partners to accelerate product development, enhance sales and marketing and grow its onboarding and client professional services. In May 2017, the transaction was recognized as the “Deal of the Year” by the ACG National Capital Region chapter. AppTek was founded in 1990 and has offices in McLean, Virginia an Aachen, Germany. 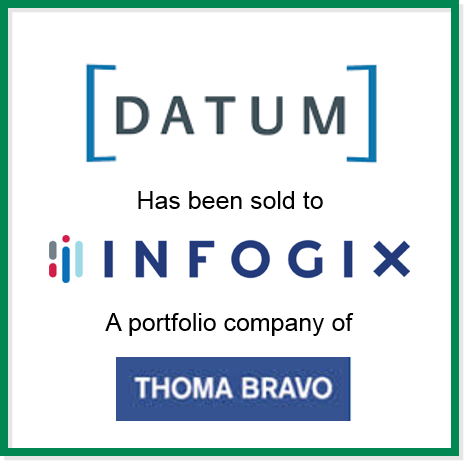 The company provides Automated Speech Recognition (ASR), Machine Translation (MT) and Natural Language Processing (NLP) software tools and services to commercial and the U.S. Government clients. eBay (NASDAQ: EBAY) operates commerce platforms that connect various buyers and sellers worldwide. Global expansion is a key priority for eBay, both to connect consumers with the things they need and love, and to enable businesses to reach new consumers in new markets around the world. Given that 20% of eBay’s transactions are cross-border, and that one of every three new users to eBay comes through a cross-border transaction, eBay had to bridge meaningful language gaps, both online and on mobile. To do that, the company needed to solve a unique challenge: provide accurate multi-language translation across a large number of language pairs that encompass more than 650 million individual listings globally. 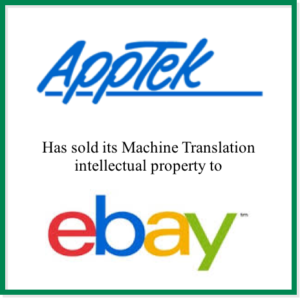 AppTek's proprietary machine translation technology will allow eBay to improve its current machine translation efforts, and to advance its new translation capabilities more quickly. Computer Prompting & Captioning Co. (“CPC”) is the premier provider of file-based closed captioning software in the United States. CPC licenses its captioning software to television stations, post production firms, government agencies, educational institutions and other enterprises. CPC serves a diverse customer base that includes about 3,000 unique users with over 4,000 license seats and provides captioning and subtitling services. The company was founded in 1986 and was based in Rockville, Maryland. Telestream provides world-class live and on-demand digital video tools and workflow solutions that allow consumers and businesses to transform video on the desktop and across the enterprise. Telestream partnered with global private equity fund, Thoma Bravo, on the acquisition. The company is based in Nevada City, California. The acquisition adds CPC’s award-winning products to Telestream’s offerings. Telestream’s transcoding, workflow automation, live streaming and web publishing products will all benefit from the addition of CPC’s technology and market leadership. Seabrook marketed CPC to a narrow group of major software companies seeking a closed captioning solution for their workflow automation. 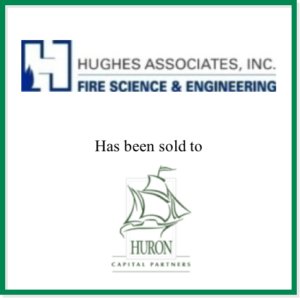 Hughes Associates, Inc. (“HAI”) is one of the largest fire protection engineering and code consulting firms in the United States. The Company boasts more than 170 trained professionals and has one of the highest concentrations of Doctorate-level engineers nationwide. HAI’s clients include the Federal government and international and domestic blue chip clients. Selected clients include, 3M, Chevron, DuPont, Exelon Corporation, General Electric, Marriot International, U.S. State Department, and Architect of the U.S. Capitol. The Company is headquartered in Baltimore, MD with 22 domestic offices and 10 international offices. At the time of the transaction, HAI had revenue of $57 million and EBITDA of $14 million. Detroit, Michigan-based Huron Capital is an operationally-focused private equity firm investing in lower middle-market companies. Founded in 1999, Huron has raised over $1.1 billion in committed equity capital dedicated to this market. Huron recapitalized HAI in partnership with existing management. Huron committed $40 million to close the transaction. Management retained a portion of equity to participate in the upside potential given the backing by Huron. Seabrook utilized its network of private equity investors and conducted a targeted marketing process with funds that have demonstrated experience with professional services firms. In late 2015, Huron exited the HAI acquisition after completing nine add-on acquisitions, growing revenues to $175 million and quadrupling the number of employees.